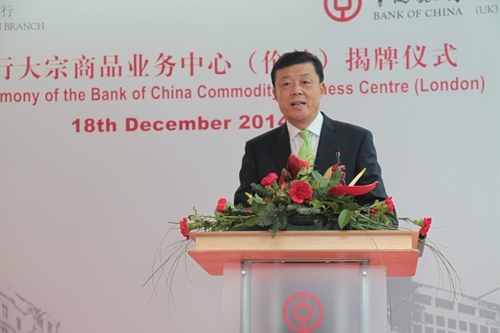 I warmly congratulate Bank of China on the opening of its London Bulk Commodity Business Centre. This year marks the 85th anniversary of the Bank of China London Branch. For 85 years, the Bank of China London Branch has continuously expanded its business and built up its strength. In recent years it has been the bellwether of Chinese banks exploring the UK market. In addition, it has been the pioneer in China-UK financial cooperation. · Expanded from renminbi spot transaction to forward transaction. · From issuing dim sum bonds to underwriting UK government offshore renminbi bonds. · From market exploration to client cultivation. Amid such impressive progress Bank of China London Branch has made a most positive contribution to deepening China-UK financial cooperation. · This will help secure a stronger foothold in the UK and serve a broader market in Europe and Africa. · It will enable closer collaboration within the Bank of China Group. · It will realize commercial and investment banking joint products the cross-selling. · And it will integrate development of the Group’s bulk commodity business and financing. The establishment of the Bulk Commodity Business Centre will enable Bank of China London Branch to take full advantage of the overall strength of Bank of China Group. Meanwhile, the UK market offers the right place and the right people at the right time. I am sure that Bank of China London Branch will make full use of its unique position. 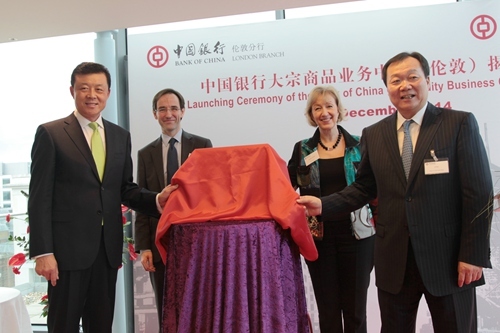 We can look forward to more splendid achievements both for Bank of China London Branch and for China-UK cooperation.